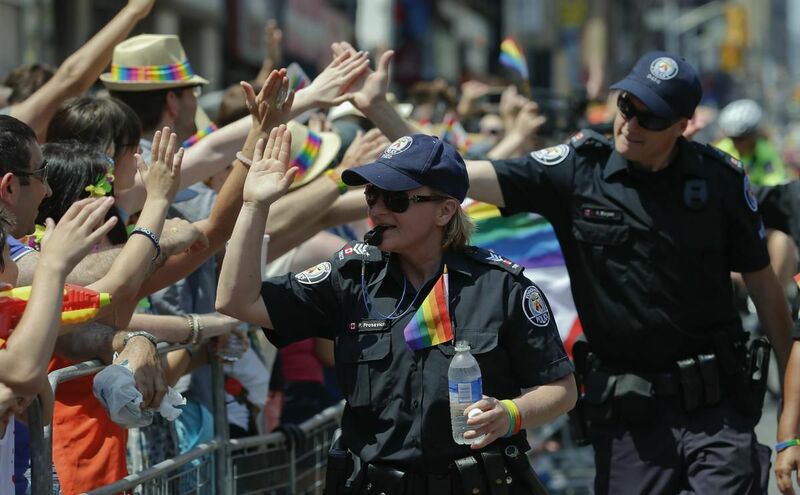 I propose that in spite of the recent highly publicized Pride Toronto membership vote to exclude police, that Pride now officially invite LGBT members of the Toronto Police Service to march as a group in this years big 50th anniversary of Stonewall pride parade on June 30. The recent vote, which carried by a mere two votes, asked Pride members whether to allow Toronto police officers in uniform (or vehicles) to participate in the parade. It said nothing about cops out of uniform marching as a group, like all other LGBTQ groups have done for decades. And many of those strong voices on the “no” side have told me that, of course, cops can march as a group out of uniform without guns or police vehicles or floats. So why not now invite the LGBTQ cops and their allies within the force (including Deputy Chief Barb Maclean, now the highest ranking open gay ever to serve in Toronto police leadership) to march in identifiable T-shirts or any plain clothes dress they wish and under a “Proud LGBT Toronto Police” type banner? READ Video reveals harm to street from landslide in Outdated Fort B.C. This is only right since LGBT cops are a member of the LGBT community. And we as a community do not exclude any openly gay people from marching. The official exclusion of any LGBTQ group from marching in Pride began in 2010. I was part of a groundswell of community activists who protested the first and only such exclusion when Pride Toronto — through its executive director of the day and under considerable political pressure from some right wing anti-gay members of city council — decreed that Queers Against Israeli Apartheid (QUAIA), a group of well-known gay activists, could not march. Many of us marched on Pride Toronto offices to protest. In the end QUAIA was allowed to march with us with open signs and T-shirts supporting their cause. No LGBT group has been banned from Pride since then. The first move against police participating in Pride came as a result of the Black Lives Matter protest during the 2016 parade. BLM, which was selected as the “most honoured group” that year stopped the parade to protest a number of things, including police participation, which they said triggered many minority LGBT community members in a negative way. There was a sorry history of a disproportionate number of black Canadians being targeted and even killed by the police. Pride’s executive director, Mathieu Chantelois, publicly signed an agreement to all the demands so the parade could continue. It did. A later meeting of the general membership debated the issues and confirmed the agreement by a democratic vote in January 2017. Police were no longer to be allowed to march in Pride. So things stood for almost two years. Then in October 2018, Pride Toronto Director Olivia Nuamah announced in a press conference with the Police Chief Mark Saunders and Mayor John Tory that she had had discussions over the past years with police and community groups and police would now be allowed to march in uniform in the 2019 Pride. Many anti-police activists protested this seemingly arbitrary executive decision by Nuamah, which led to the plebiscite last month. But the tradition in Pride Toronto has been to include all LGBTQ groups who want to participate in the parade. Even in this important anniversary year of 50 years after the Stonewall riots, New York City Pride will once again allow uniformed police to march. And while there has been much justifiable anger at Toronto police recently for a number of negative interactions with the community and misdeeds, including recent murder and disappearance investigations, it isn’t right to deny LGBT officers who are brave enough to publicly identify in what has often been a homophobic police culture should to march. And nothing in the January vote disallows these courageous officers, many who often face discrimination and bullying from within the force, from marching in the parade as an identified group, as long as they are out of their official TPS uniforms. James Dubro is a veteran crime journalist who has lived, worked, played and often researched crime and policing in Toronto’s gay village area since 1970.